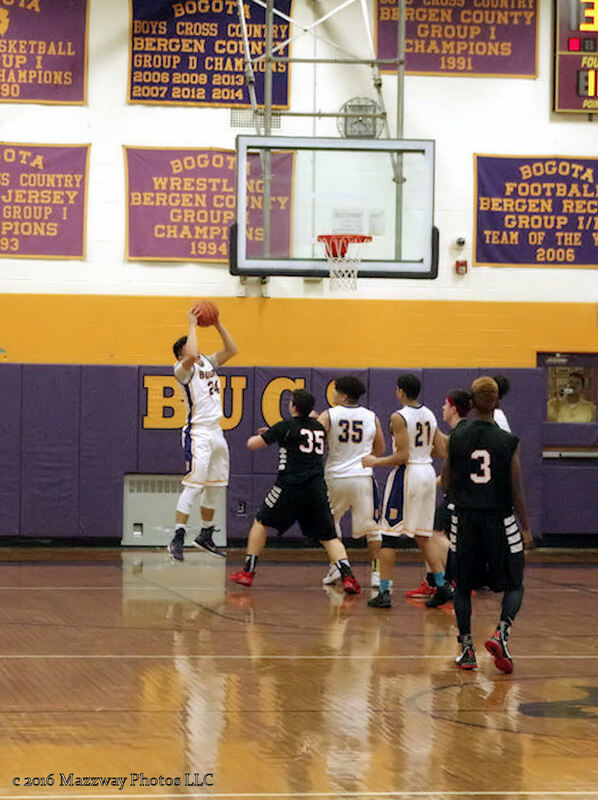 On Thursday 25-February the Bogota Bucs Men's Basketball team secured a tie for the Patriot League title with a 63-53 win at Saddle River Day School. Bogota started the game by taking a 15-8 lead after the first quarter, and had the Rebels pull within three points at halftime. Bogota built their lead up again after the restart, and then played even at the end of the game, to give Bogtoa the win. This win and Park Ridge defeat of Midland Park gave both teams a 14-2 record in the league, with both team splitting their season series. Chris Alcantara had a game high 18 Points and 13 Rebounds, and 3 Blocked shots, Andrew Riad had 2 Three Point baskets. Bogota finishes their regular season play with a record of 18-5. The Men's team will be ranked # 3 for their North 1 Group 1 Tournament. They will play their first round game at Home in Speary Gym against #14 Hopatcong. This will be on Monday-29- February with a 7:00p start.